In the past the caravans used to take overland paths of the Great Silk Road seeking after the shortest routes possible. Today the airliners of "Uzbekistan Airways" fly above the ancient caravan trails following the most optimum air routes. In Uzbekistan, aircraft regular flights began in 1932. But at that time there were no international flights on its timetable. By the time Uzbekistan got its independence in 1991, the country had had a diverse fleet of aircrafts, all manufactured in the Soviet Union. Moreover, the equipment had almost 70% service wear. To attend the issues in 1992 there was set up National Airline "Uzbekistan Airways". One of the strategic plans of newly-born company was to create a wide network of international air communications. The first international flights from Tashkent to various destinations in Asia were carried out on the airplanes of the Soviet manufacture. At the same time several Airbuses A-310 and Boeing have been purchased in Europe and the USA. These aircrafts enabled "Uzbekistan Airways" to expand the geography of destinations. 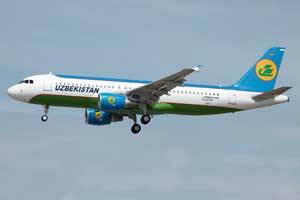 Today "Uzbekistan Airways"fly to 40 countries of the world and has 45 representations in 25 countries. Sixty-nine flights, including 19 flights from Tashkent, are carried out on a weekly basis to cities and towns of the CIS countries. Every week 165 flights serve various destinations within Uzbekistan. Under the State program of civil aviation development the company has replenished its aircraft fleet with the most updated and superior airliners. Thus from January, 2011, Uzbekistan Airways removed outdated TU-154 aircraft from the airline`s fleet. Now the technical park of the Company includes 25 airliners of western manufacture. Among them are Boeing-767 and Boeing-757, Airbuses A-310 and A-320 and RJ-85. While renewing its fleet the Company seeks after optimum combination of such aircraft characteristics as reliability, capacity, flight distance and efficiency. 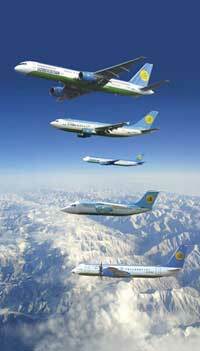 "Uzbekistan Airways" has become known as one of the most authoritative and trustworthy air carriers. As a result of successful operation the company is awarded the Flight Safety Foundation Diploma and a Recognition Award of the Boeing Company for safety and reliable performance in operation of Boeing airplanes during ten years. In 2009 Uzbekistan national air carrier successfully passed the IOSA audit developed by the International Air Transport Association (IATA). The list of standards (more than 900 items) included all major areas of civil aviation activity. "Uzbekistan Airways" contributes to the development of international tourism, fruitfully cooperates with tourist companies, and actively participates in tourism fairs. Due to the fact that alongside with Tashkent Airport, airports in Samarkand, Bukhara, Termez and Khiva enjoy the status of international airports, travelers from all over the world can make a comfortable flight to these ancient cities located on the Great Silk Road.